Since 1945, The Salvation Army Philadelphia Temple Corps Community Center has served men, women, children of all ages and seniors through its Bible-based ministries, programs and services in the heart of the North Philadelphia community. All of these programs include Bible studies, Church services, emergency food and clothing, counseling, assistance with utilities, afterschool programs, summer camp and facilities that are available to the local community for meetings and events. The Salvation Army Temple Corps Community Center has undergone changes since its rededication in 1975. All of its programming is being designed to move constituents further toward their goal of independence. In addition to our spiritual and social service ministries of outreach to the community, one program being enhanced is the Learning Zone afterschool program. 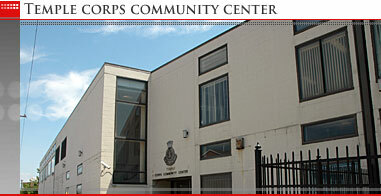 The first Salvation Army Learning Zone in Philadelphia was implemented at it’s Temple Corps Community Center in 2004 with the goal of offering activities to simulate and motivate children and youth to think “outside the box”. The staff of the Learning Zone places a great deal of time and planning into the activities for program participants and have won the admiration and support of parents and the community. The Salvation Army Philadelphia Temple Corps Community Center is a place of change and in keeping with The Salvation Army’s mission; it will continue reaching out to everyone to provide programs and services to meet human needs without discrimination.